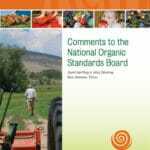 When Congress passed the Organic Foods Production Act of 1990 it included an important buffer assuring the organic community that we would never lose control over the true meaning of the organic label: a diverse 15-member stakeholder board that had true statutory authority and power — the National Organic Standards Board or NOSB. Citizens and farmers created organics as an alternative to industrial-scale agriculture and food production. As companies like Dean Foods, General Mills (hiding behind the façades of WhiteWave and Small Planet Foods respectively), Smucker’s and other agribusiness giants invested in gobbling up organic brands (Silk, Horizon, Cascadian Farms, Knutson, etc. ), they sent their lobbyists and the Organic Trade Association to Washington. During the Bush and Obama administrations they found a receptive audience at the USDA’s Agricultural Marketing Service. Big Ag was no longer fighting organics — they wanted to own it. And they wanted to shift the focus away from sustainable, regenerative agriculture and humane animal husbandry, to models they knew and loved: environmentally exploitative mono-cropping, factory farm livestock production and container ships filled with cheap organic commodities from countries like China. And they wanted to use many of the same synthetic ingredients, nutraceuticals, flavorings, colors and processing chemicals that made manufacturing processed food cost effective and “attractive” in the marketplace. Only this time they would add a higher profit margin and package it in a green wrapper. One of their Washington success stories was stacking the NOSB with agribusiness executives and industry-friendly collaborators. If the spirit and letter of the organic law had been respected the NOSB would be comprised of four farmers, three environmentalists/conservationists, two public interest/consumer representatives, two handlers/food processors, a scientist, a retailer, and an organic certifier. Out of these 15 members, only two could be representatives of agribusiness (food manufacturers). But Congress’s intention has been abused. Today, two of the four “farmers” appointed by the Obama/Vilsack administration worked for the almost billion-dollar-a-year business enterprise Organic Valley and Driscoll’s, the largest conventional/organic berry producer in the nation. There is a serious question whether or not these two full-time agribusiness employees legally fit the criterion of “owning and operating an organic farm” (mandated by Congress) when they were appointed. But just as poignant is the question, out of the thousands of organic farmers, who crack a sweat and get their hands dirty every day, and whose livelihoods depend on the integrity of the organic label, were these two the best and most representative parties to serve on the board? If you worked for the Organic Trade Association, where both Driscoll’s and Organic Valley are powerful members, you probably think big business employees on the board is a good idea. And of all the great member-owned cooperative grocers in the country, which helped found organics, none holds the retailer spot. Instead, you’ll find an employee of the nearly $20 billion grocery chain Whole Foods deciding national policy. It has never been more important to find independent and qualified members of the organic community to serve on the NOSB. The USDA is attempting to strip the power Congress vested in this body. We need board members who will stand up to the USDA’s strong-arm political tactics and protect the interests of organic farmers, consumers and ethical business entrepreneurs. Citizens can apply for one of the four current openings on the NOSB from now through May 15. But time is short. This is a political appointment made by USDA Secretary Tom Vilsack. It would be wise to have some support lined up with endorsements from local politicians and organic industry stakeholders. And we would suggest that qualified and independent applicants promote their candidacy by making it public. We hope it will be hard for Secretary Vilsack to pass over eminently qualified candidates, and appoint more corporate shills, if the public is aware of the choices. We will help publicize the names of these qualified applicants. At least once in the past, the USDA publicly announced all of the nominees for the board so that organic community members could chime in and help the USDA Secretary select the best and the brightest. This has never happened during Secretary Vilsack’s tenure. Cornucopia has once again asked Mr. Vilsack to increase transparency in this important process. 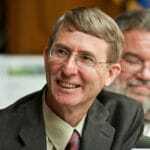 In the meantime, we hope that other independent candidates will make it known publicly that they are standing for nomination to the NOSB, willing to serve the interests of the public and help preserve the true meaning of the organic label ­— instead of carrying the water for agribusiness employers and patrons. The USDA is requesting nominations to fill four (4) upcoming vacancies on the NOSB. The positions to be filled are: environmentalist (1 position), producer (1 position), handler (1 position), and retailer (1 position). The Secretary of Agriculture will appoint one person to each of these 4 positions to serve a 5-year term of office that will commence on January 24, 2015, and run until January 24, 2020. Nomination applications are to be sent to Rita Meade, USDA–AMS–NOP, 1400 Independence Avenue SW., Room 2648-So., Ag Stop 0268, Washington, DC 20250, or via email to [email protected].